Sunday June 2 1907 It was a beautiful day. I did up the morning work and went to church. Got my dinner over and read a little. Will went over to Art Jones on some business Mr. [Minger?] here of an errand. I went to church down to Coralville in the evening. I was very tired at bed-time. 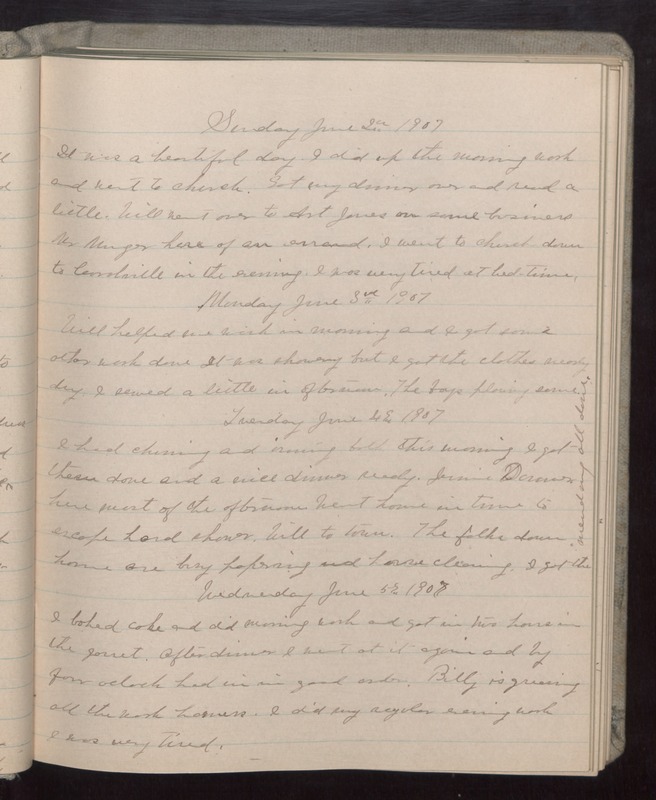 Monday June 3 1907 Will helped me wash in morning and I got some other work done It was showery but I got the clothes nearly dry. I sewed a little in afternoon. The boys plowing some. Tuesday June 4 1907 I had churning and ironing both this morning I got these done and a nice dinner ready. Jennie [Donovan?] here most of the afternoon Went home in time to escape hard shower. Will to town. The folks down home are busy papering and house cleaning. I got the mending all done. Wednesday June 5 1907 I baked cake and did morning work and got in two hours in the garret. After dinner I went at it again and by four oclock had in in good order. Billy is grooming all the work horses. I did my regular evening work I was very tired.